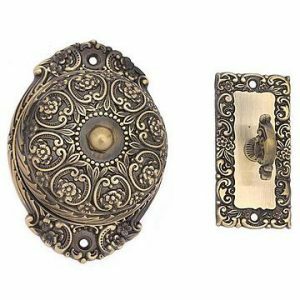 A beautiful, solid brass mechanical doorbell from Van Dyke’s Restorers is the perfect accessory to announce your guest’s arrival in period style. 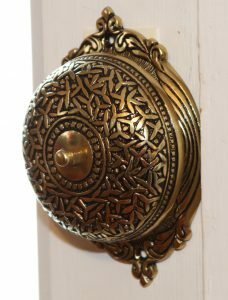 Once a staple on Victorian and Colonial style homes, the mechanical doorbell brings a nostalgic touch to any home. As an alternative to the door knocker before electricity, mechanical doorbells offered a musical announcement for visitors at the door. Mechanical doorbells require only a simple twist of the finger turn to emit a charming tone from the bell. Two types of these doorbells were common. One style was mounted with the lever on the outside and the bell on the inside, while the other was installed on the outside of the door only. 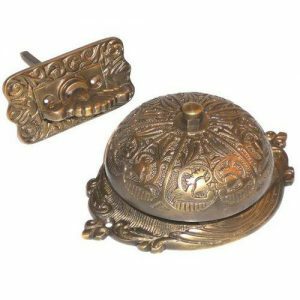 In keeping with the period style, mechanical door bells were usually ornate in design with Eastlake designs particularly popular. In addition to several Victorian, Eastlake and Craftsman style doorbells, Van Dyke’s also offers an elegant replica of the iconic Russell and Erwin No. 98 (our Victorian Twist Doorbell with Ornate Dome 201877 pictured to the left). First introduced in 1893 at the height of the Golden Age of builder’s hardware, this masterpiece incorporated a patented compression bronze manufacturing process to forever capture its exquisite detail in handsome solid brass. Today, mechanical doorbells add a unique and vintage look to any front door. Because they are non-electric, they are easily installed without the need of an electrician. 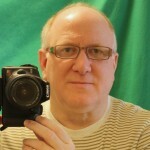 Most models are made of brass and offered in black, bronze, brass, and nickel finishes. These pieces of history are hard to find and not available at the local big box store, but can be purchased from Van Dyke’s Restorers.